It was with consternation that we downloaded yet another crossword by a recently deceased compiler. Surely this series has to come to an end! How appropriate, though, that Syd Lexis should be giving us his cruciverbal creed as his final word. We dismissed our sad thoughts and began to solve happily (and Syd Lexis set the tone! On my initial scan through the clues he made me wonder whether all our old compiling friends are still enjoying their Listener Setters’ tipple together in a happier setting ground somewhere up above.) ‘Blue, extremely sad, turning to liquor (5)’ he told us – giving an extra D and SMALT. ‘Yeast in Champagne is most basic (6)’, he continued (BAR[M] + EST). There was a lady drinking with them: ‘Greedy person, old maid holding advantage, maybe begged drink in Argyle (8)’ (HOG + MAY round [V]AN = HOGMANAY) and finally ‘Mouths introduced to punch – sweet drink (5)’ (OR[A] in MAT). That fine sentiment, with PURE AND WHOLESOME fitting symmetrically in the centre of the grid, of course, gave us lots of letters of the unclued lights and, with the help of Mrs Bradford, we were now able to complete PRISTINE, NEAT, WORTHY, ABSOLUTE, SENSIBLE, CHASTE and SPOTLESS, with just a hint of doubt whether our final word was to be MERE or FINE. Fortunately, we had been given those extra letters for the unchecked entries which confirmed that we needed an I in that word and we worked out that the F?V?L word had to be FAVEL (FL for FLourished with AVES nesting inside it). What a fine, straight-forward solve that we enjoyed from start to finish. Mr Lemon last week and Mango this week when they have just lost one of the three compilers. Well, with the genius of that team, this promises to be quite something. OMG, that preamble! One of the Numpties almost despaired on reading about numeric values O to d-1 and ‘base d‘. Even the more mathematical Numpty stomped off in a huff at first but was tempted back when I commented that the clues seemed to be remarkably approachable for a Mango compilation and that the grid was filling nicely. No problem reaffirming the Mango affiliation to the Listener boozy club. ‘Maybe like a dingy old Australian claret (5)’ gave us O + A + RED, though why setters with such taste would be imbibing dingy old claret, I can’t imagine. However, there was ‘A Mediterranean vessel acting something like a small schooner (7)’ TARTANA (TARTAN + A) – maybe they resorted to something Mediterranean in that schooner. We speedily latched on to what was happening with those clues that required movement of a special letter before solving (a thematic number quickly defined itself as 12 since we know how strictly Mango observe symmetry and each one we solved in that top section of the grid was going to have a partner at the bottom or vice versa). RA and TE were gifts, weren’t they? ‘Sun god had to eradiate beams essentially (3)’ required us to shift the E, giving ‘Sun god head to Radiate + beAms (essentially)’ and ‘Note ten wives anew (3)’ had to become ‘Note ten waives New, so TEN lost its N’. Once we had the trick, the remaining ten were fun – except 43 across where we were somewhat perplexed even after we had established, because of the endgame, that M had to be the moving letter. It was only then that we saw that this was a delightfully hidden word; ‘Attention from aid inside mart (3) became ‘Attention from amid insidE ARt’. Delightful! 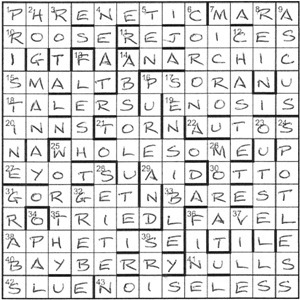 An almost full grid with only a couple of clues in hiatus. We were not sure about ALWIN at 31dn ‘Boy accepted fifty penny coin out of circulation (5)’ but the next p.d.m. confirmed that and showed us where we were heading. There, in lovely Mango symmetry were SPRING, SUMMER, AUTUMN and WINTER and we rushed to Wikipedia to see whether this was a Vivaldi anniversary. Surprisingly, the year wasn’t but the date was (almost – we learned that he was born on March 4th 1678, which of course, gave us values for SUMI) and we practically side-stepped the calculating of those base 12 summations when we decided that il prete rosso was going to give us PRIEST as the word the seasons would add up to, and that he had to be RED. Our calculations were now rendered somewhat easier, since, of the 12 letters that had been played with in the clues, only six were left and two of those were automatically assigned to Alarums and Ute, and M already establised. We had only G,W and N left. 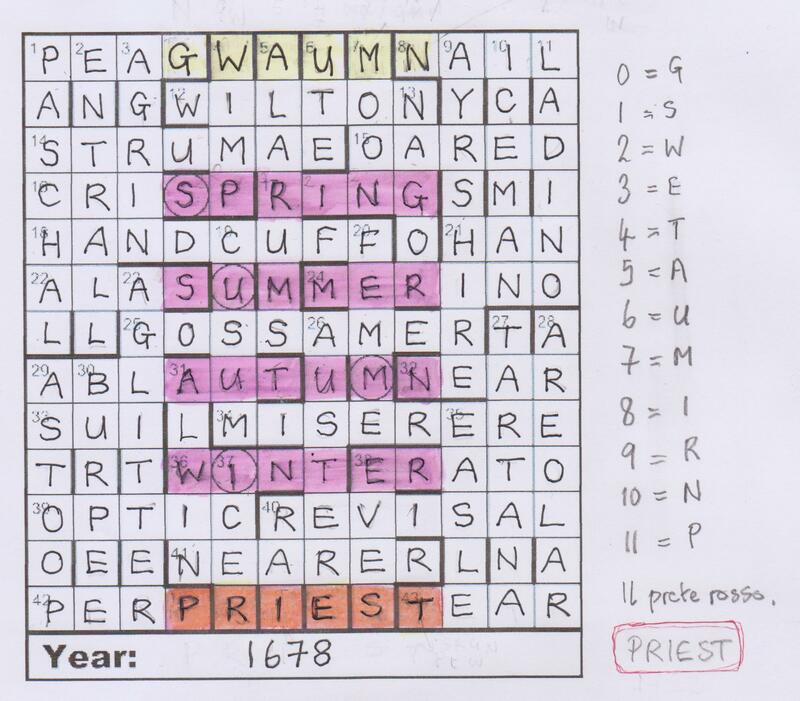 It was not an excessively difficult calculation to work out how each of those, added to the letter that had moved in the clue, totted up to 11 and we soon established that G had to be O, the first in an ascending series, with W as 2, and N as 10. Even I enjoyed the maths – and this crossword in its entirety. I wonder how many more Mango crosswords are in the editors’ files. Lots, I hope! Many thanks to Radix and the other Mango men. A Mango treat this week, so we were in for an entertaining (and probably tough) time. The last Mango puzzle, Listener 4260 Nuts and Bolts was superb with its William Tell theme, but it tripped me up and I was determined not to fall into any traps here. Of course, traps are easy to spot if you know what you’re looking for… but then they wouldn’t be traps, would they? With a Listener, traps can often be avoided by careful reading of the preamble. The preamble for Movements was somewhat daunting, and seemed to indicate that a bit of mathematics would be required later. Well, as I say, that’s for later; here we had letters to move in some clues, and some answers that would be one letter too short. 1ac Rope in local eel? Perfect en aspic (starters only) (4) led to PEA from initial letters, and a quick check in Chambers showed that ‘pea’ was also salmon roe. Moving the P from ‘rope’ to ‘eel’ and then checking peel5 via peal2 showed that to be a local word for grilse (young salmon). In went PEA (one letter short of entry length), accompanied by the hope that the research needed for every clue would be less convoluted! I was relieved when 8ac Trouble with loth learners (4) was simply AIL, needing to be read as Trouble with sloth learner (4). Well, that was the two top row clues, and knowing Mango’s predilection for symmetry, I expected the two in the bottom row to be special clues as well. They would have to wait, as I wasn’t in the mood to skip my first run through the clues. I managed a flurry of across clues, though… indeed more than I was expecting from Mango. These included the delightful 14 Mature soprano developed swellings in throat (7) for STRUMAE. Eventually I reached 42 For each pie’s crust, a sliver of gratin (4) and 43 Attention from aid inside mart (4) leading to PER and EAR respectively. I assumed that the first just needed the G moving from the front of ‘gratin’ to the end. Before embarking on the down clues, I looked at the four short entries. Needless to say, they could all be augmented by several different letters to make new words. ·AIL could become one of a dozen words, and that was without Dáil or Gail! I wondered how many short entries the downs would reveal, if any. Unfortunately, the answer to that would have to wait since my paltry tally of eight answers didn’t include any short ones. However, 1 PASCHAL, 10 ICE MAN and 23 AGLITTER meant that most of the grid was developing nicely. When I did get the short ones at the top — 4 IMP, 5 LARUMS, 6 TE and 7 OON — a quick re-evaluation of the symmetrically-placed clues and the short entries were revealed. I particularly liked the clue to 6 TE: it must be difficult to come up with something interesting, but Note ten wives anew (3) was superb, needing to be read as Note ten waives new (3). I finished the grid in a much shorter time than I had expected, and it didn’t take long to see SPRING, SUMMER, AUTUMN and WINTER lurking in the grid. No doubt many solvers saw the four seasons as they went along, but I deliberately take one step at a time and concentrate on just the clues unless I get stuck. So, with the title as confirmation, it looked as though we were in Vivaldi country. The letters which had moved in the clues were, in clue order, P S G M R U A T I W N E, all the letters needed to spell the names of the seasons. So, the thematic number of clues, d, was 12. Moreover, “The sum of a clue’s moved letter and the entry’s added letter is the same in each case”, given by the preamble, meant that the letters moving in clues and those plugging entry gaps formed six pairs. Also, the six letters in the bottom row would probably be where the sum of the four words would be found, ie “suitably placed”. 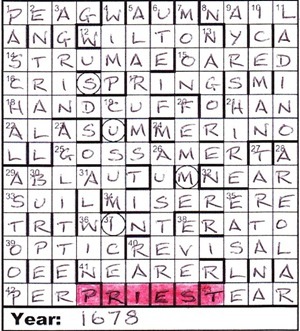 It didn’t take long to get PRIEST along the bottom, completing the entries PERP, ICER, RAI, AUSTERE, EVES and TEAR. Along the top, apart from ALARUMS and UTE, there seemed to be a couple of alternatives. Well that should be easy, I thought, and proceeded to prove myself wrong! Since it was a year to be entered in the bottom of the grid, represented by SUMI in the circled cells, it seemed that S would be 1. It was probably Vivaldi’s year of birth, year of death, or the year in which The Four Seasons was composed. I decided to try and do the maths unaided by anything other than the 1. Amazing! I slotted 1678, the year of Vivaldi’s birth, into the space under the grid. It needed a bit of googling to determine what colour PRIEST needed to be since I do not (yet) possess a copy of Chambers Biographical Dictionary. It seems that he was known as the Red Priest. Although Brewer’s gives Vivaldi under Red Priest, there is no entry for Vivaldi pointing to this, otherwise I am sure Brewer’s would have been given as the reference. As expected, another tour de force from Mango. I wondered if there were any other puzzles waiting in the wings from this triumvirate of setters, given the passing of Radix, one of their number. I hoped there might be at least one to look forward to. Coordinated by Mr Lemon. A moment’s silence from the Numpties! We knew that there would be another Mr Lemon crossword almost a year after his death but it was still a shaky moment to find it in front of us. 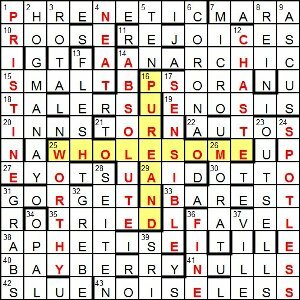 One thing we could be sure of: a crossword by the previous editor of the Enigmatic Variations series was sure to obey all his own very strict rules and to be a pleasure to solve – as indeed it was. Carte Blanche, too (but I have said before how I like those, as they have to have transparent clues in order to be solvable). No word lengths! There is a brief hint of dismay that is quickly mitigated by the information that the grid will be 180-degrees symmetrical and the solutions are clued in alphabetical order. That’s a fine combination! Co-ordinates! Now that is interesting. Weren’t they a creation of René Descartes – the COGITO ERGO SUM polymath? There is to be a quotation to highlight – could it be…? And will it be in that obvious 13-letter place, the leading diagonal? Ah no! The quotation is associated with the inventor of an unclued nine-letter entry. We are not aware of any Cartesian inventions. We got to know Mr Lemon fairly well over the years and I know he enjoyed his glass of whisky, so I don’t need to check for evidence of membership of the Listener Imbibers’ Corps but I do, all the same, and Red Eye is there, and a cask in the following clue (though why a priest would be keeping lithium in it, we shall probably never know). When I say ‘got to know fairly well’, there are nuances. Mr Leonard kept a tight rein on his EV setters and never minced or wasted his words. One of his early missives to me said “Hopeless grid! 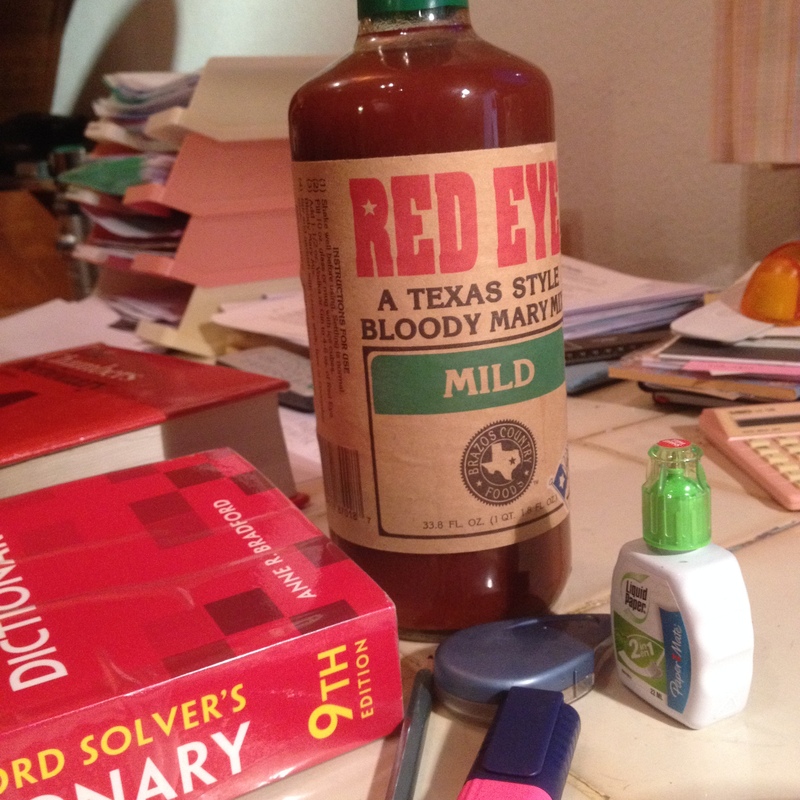 Set it again using this.” (a generous gesture from an editor!) Another was “Too easy: solved it as my coffee cooled.” We had an amusing little game going amongst the setters. Who could get the shortest response? Another setter was leading the pack with ‘Fine now. James.” until I received the outright winner. New setters had to snail-mail two copies of size 12 print, double-line spaced etc., but, with time, email was allowed. I emailed the query ‘Shall I send the revised copy by ordinary mail too?” and received “No. James.” Beat that! We raged and fumed to each other when our clues were rejected for quirky reasons, but all were ultimately of one mind. It was James Leonard, with his strict rules and helpful input who taught us much of what we know about setting … and solving, even when it is one of his own. All these clues obeyed his own strictures and this grid filled with lots of pleasure and pretty fast. Obviously, with two coordinates to combine into the wordplay of every clue, anagrams were going to be the order of the day. And they were! 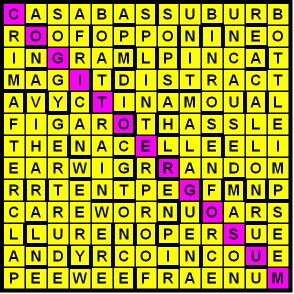 I have just found 19 total or partial anagrams in a total of 47 clues, with a delightful range of anagram indicators (barking, working, unusual, contrived, injured, smashed, foreign, scrappy, revised etc. – and, of course, no noun indicators – they were a red rag to MrL!) These gave us BOAT TRAIN, CAREWORN, AFTERCLAP, TINAMOU, and NACELLE and with those so-helpful coordinates, the grid began to fill. Suddenly SPLINTERPROOF was the only word that TEA could fit into the available letters and, sure enough, there was another partial anagram STERLING MP, that gave us the GM coordinates and SPLINTER followed by a mini clue to PROOF (demonstration). We were in Cartesian philosophy here, and now COGITO ERGO SUM was clearly going along that diagonal. With a couple of awkward corners filled (CRIM, COUE, PERSUE, INGRAM – there are this week’s Numpty words to casually drop into dinner conversation) the grid was full. I scoured the bookshelf: but I didn’t need to, did I? Under Cartesian in Chambers I find ‘Cartesian devil, diver or bottle-imp n a scientific toy named after Descartes, a glass container with a floating figure that sinks when the top of the container is pressed. Aah! So after all MrL has truly guaranteed eternal membership of the tipplers’ club. 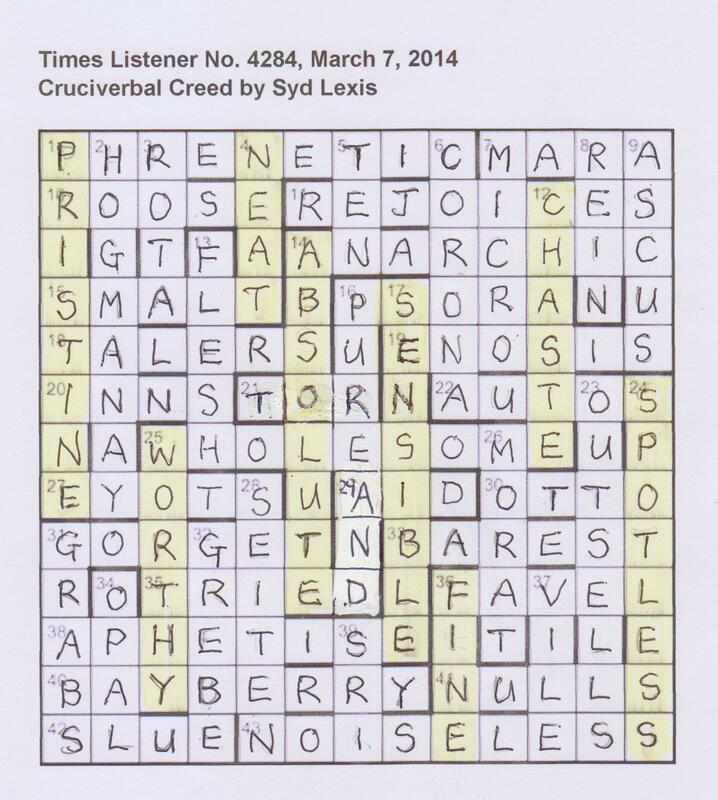 This must be the first Listener crossword themed around a bottle since Mash’s Klein Bottle crossword. Thank you Mr Lemon! Such a gentle and kind figure, entertaining us and teaching us a year after you have left us!